The deer have 9 lives so far this year! Pigs are a nice substitute though. For those that want to know...Cari-Bow Peregrine 48 @ 27..GT3555 with SF 180 grain on the end. 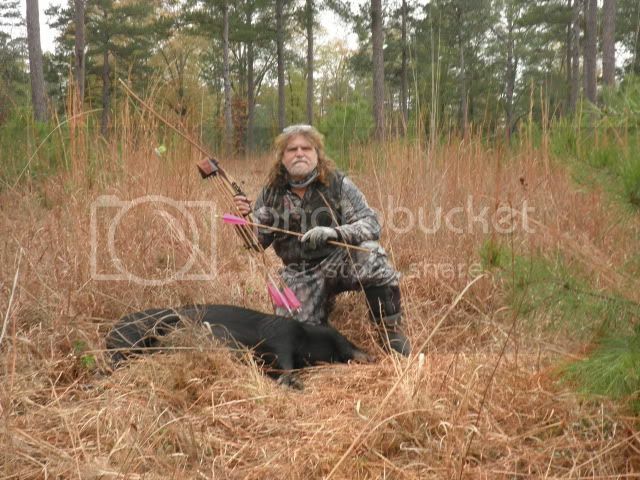 "when bows shoot faster than 300f.p.s it ain't called bowhunting no more.."FRED BEAR"
Ribs and ham for the New Year! Congrats! Nice pig and hardware!Looks like south Ms.woods in the background.Congrats. Way to go! The pigs gave me the slip this year. Nice porker. I so want to shoot one of those. Nice going.In that picture You look like you belong out there, cool picture.